Feral cats can be found nearly everywhere there are human civilizations and a food source. Feral cat rescue is done using trap-neuter-return. If a kitten isn't socialized to humans within his first few months, it is unlikely the cat will ever become tame. Because of this, the accepted method is trapping feral cats, having them spayed/neutered and vaccinated, then returning them to their territory. Discuss the feral cat situation with neighbors, landowners and others in the community. Explain what a feral cat is and how you plan to help. Explain that returning the feral cat to its home territory is the only humane option and that the feral cat will provide rodent control. 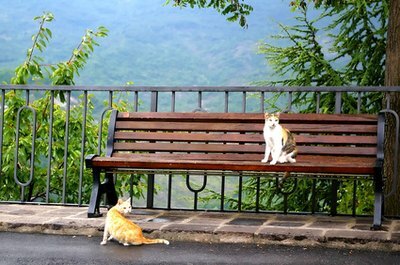 Once the cat is spayed/neutered, neighbors won't have to worry about many of the unwanted behaviors that accompany having feral cats living nearby. There will no be constant unwanted litters of kittens and there will no longer be sounds of fighting and mating. Talk with the veterinarian who will be doing the spay/neuter for the feral cat and schedule a tentative appointment for the day after you intend to trap the cat. Begin feeding the cat on a regular schedule, about twilight is best. Maintain the schedule for a couple weeks so the cat gets used to showing up at the same time. Place the trap at the feeding site a couple days before you plan to trap. Cover it with a sheet. Do not set the trap, just place it on the ground near your feeding area. This will allow the cat to get used to its presence and smells. Withhold food on the night before you trap. Bait the trap with the canned fish at the same time you would normally feed the cat. Set the trap, leaving the sheet in place. Push the sheet back enough so that the cat can easily access the trap's opening. Monitor the trap every couple hours throughout the night. Move the trap to an area where the cat will be safe until morning, once he has gone into the trap. Usually a garage or outbuilding is best. Deliver the cat to the veterinarian the next morning. The veterinarian will spay/neuter, vaccinate and ear-tip the cat. Ear-tipping is the removing of about a quarter-inch off the tip of the cat's left ear. This is a universal symbol that this feral cat has been spayed/neutered. Hold the cat in its trap for 24 hours after surgery, following your veterinarian's instructions regarding feeding and watering. Return the trapped cat to the area in which he has been living. Feed, water and monitor the feral cat every day. Doing trap-neuter-return work is usually not limited to just helping one cat. Most feral cats live in colonies of cats. In order to help one cat, you must provide trap-neuter-return for all of the cats in the colony. What Can Be Done With Feral Cats? What Is a Feral Kitten? What Is the Origin of Tuxedo Cats? What Is the Difference Between Orange Cats & Tabby Cats?